Any arrangement of a set of n objects in a given order is called Permutation of Object. Any arrangement of any r ≤ n of these objects in a given order is called an r-permutation or a permutation of n object taken r at a time. Theorem: Prove that the number of permutations of n things taken all at a time is n!. Example: How many 6-digit numbers can be formed by using the digits 0, 1, 2, 3, 4, 5, 6, 7, 8 if every number is to start with '30' with no digit repeated? Solution: All the numbers begin with '30. 'So, we have to choose 4-digits from the remaining 7-digits. Theorem: Prove that the number of different permutations of n distinct objects taken at a time when every object is allowed to repeat any number of times is given by nr. Proof: Assume that with n objects we have to fill r place when repetition of the object is allowed. = n. n. n..............r times =nr. A permutation which is done around a circle is called Circular Permutation. 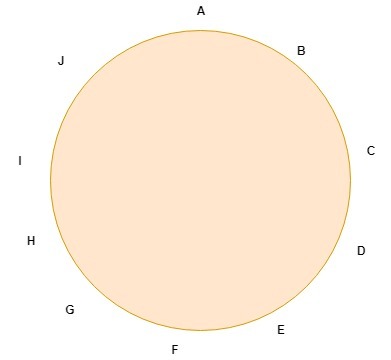 Example: In how many ways can get these letters a, b, c, d, e, f, g, h, i, j arranged in a circle? Theorem: Prove that the number of circular permutations of n different objects is (n-1)! Proof: Let us consider that K be the number of permutations required. For each such circular permutations of K, there are n corresponding linear permutations. As shown earlier, we start from every object of n object in the circular permutations. Thus, for K circular permutations, we have K...n linear permutations. A Combination is a selection of some or all, objects from a set of given objects, where the order of the objects does not matter. The number of combinations of n objects, taken r at a time represented by nCr or C (n, r). Example: A farmer purchased 3 cows, 2 pigs, and 4 hens from a man who has 6 cows, 5 pigs, and 8 hens. Find the number m of choices that the farmer has.